If you have never been to Chicago, you wouldn't really know that it used to be one of the most cigar-friendly cities in the country. That was until 2008, when Illinois enacted a strict, statewide anti-smoking law that only exempts a venue if it meets certain requirements, including that it derives 80 percent or more of its gross revenue from tobacco sales. The challenge for tobacco stores, of course, is that they pay rent on square footage. So, if the sales of tobacco are not robust enough to allow you to put in a lot of seats, you're not going to have much of a cigar lounge. Then came Biggs Cigar Emporium, which opened in September 2014 and later added a semi-private cigar lounge. "It's just a big tobacco store," explained Richard Bley, semi-jokingly. Bley is the well-dressed gentleman you see in the shop downstairs at Biggs. The store easily has one of the biggest selections in the city and features a corona-sized cigar by Hendrik Kelner, Davidoff's longtime master blender, called the Bespoke Gran Mareva. Ashton ESG can be found in the humidor, as well as numerous other brands such as Arturo Fuente, La Flor Dominicana, Padrón, Drew Estate, La Palina and Davidoff. The mansion is still getting touched up. It's a big place. "Everything in the house is original," said Fred Latsko, a Chicago developer and the owner of the building. "It was built in 1891." Latsko explained how the mansion was an ill-fated Italian restaurant in its immediate previous incarnation. "They put in a drop-ceiling downstairs. We spent a lot of money taking that out and restoring it to the original condition." Latsko's vision included building out the block on which the cigar lounge is located. Latsko partnered with hospitality veteran Gabe Garza to run Ideology Entertainment. The group has already put in three restaurants on Dearborn and Elm Streets, in the city's Gold Coast district. The block can be your entire night out. Have dinner at the Italian La Storia right next door or at Q, a barbecue restaurant that boasts chef Art Smith, famous for his culinary talent and association with Oprah Winfrey, as its pit master. (The fried chicken is exquisite, as are the hush puppies and fried green tomatoes.) Smith will also helm Blue Door Kitchen and Farm Stand, a farm-to-table restaurant around the corner. Have a meal. Have some drinks. Then go have a cigar in maybe the nicest cigar lounge you'll ever be in. Latsko said part of the motivation for creating the cigar space was so he and his friends, some of whom he was greeting on a recent visit, could enjoy a smoke. Almost every room has a flat-screen TV. The first floor has two American Heritage billiards tables with elegant blue-gray cloths. There is a bar, but no liquor can be served by the staff. "We can't touch or serve booze," Garza explained. "Nor can members keep it in their lockers." You want a drink? Bring a bottle. The staff will set you up with glasses and ice, but you'll have to pour your own. The same goes for food. Order in from one of the restaurants. The second floor is large enough to hold a sizable party, even if cigar-smoking is not on the menu. "We put in double the ventilation we need," explained Garza. "We didn't want anyone to be concerned during an event that cigar smoke was going to float in." If you buy a cigar at Biggs, you'll be invited to smoke in one of two rooms downstairs. If you want to use the rest of the space, the fee for the day is $50. Membership, which comes with the purchase of a cigar locker humidor, is $2,500 a year. Of the 300 lockers available, 200 have been sold. 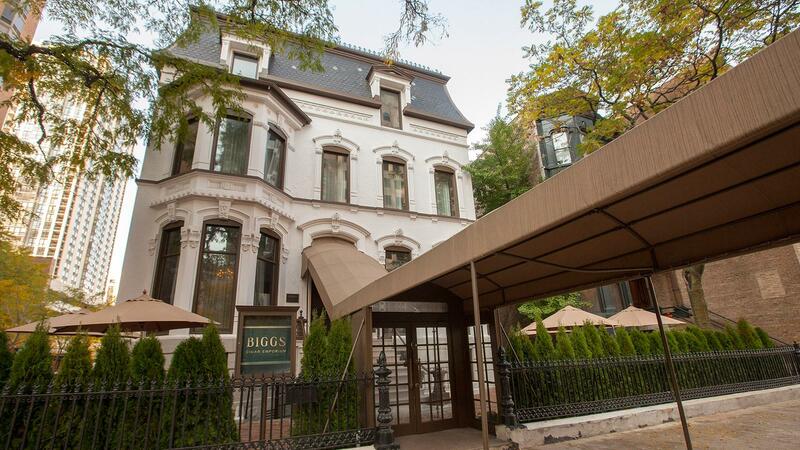 The Biggs Mansion has a lot of history. It's firmly ensconced in recent Chicago legend as the location where parts of the restaurant scenes in Ferris Bueller's Day Off and The Blues Brothers were filmed. The best history, however, has yet to be made in the Biggs Cigar Emporium. It will be your own experience, perhaps when you open that bottle of Ron Zacapa 23, light your favorite cigar and relax late into the night on one of the leather couches on North Dearborn. Open every day: 11a.m. to 11 p.m.